Let’s Play Pretend – Anticipate! Pretend you run a business that sells widgets that are critical to a buyer. The price of each widget is $1000.00 and the buyer needs 100 of them. That’s $100,000. Now let’s pretend the cost of each widget (materials, labour, reasonable marketing costs, equipment maintenance, transportation costs, etc.) makes up 80% of the market price, leaving you with a gross profit of $20.00 per widget or in the case of this order of 100, a gross profit of $20,000 or 20% of the total price. Now imagine the buyer informs you that it does not pay proportionately for your accounting services, facility costs, delivery costs, or marketing costs. The buyer’s rationale is really interesting; they believe someone else should pay for those costs. Now imagine the buyer suggests your staff should be paid less than their staff and not have benefits as good. And then imagine being criticized for putting some money in the bank to cover a crisis and being told they don’t approve of that (even though they have money saved for their rainy days). How would you feel if you were the Widget Company? This is often how contract or funding agreements are set up with non-profit agencies. Some contracts are structured in a way that do not allow non-profit organizations to offer competitive compensation, much less a reasonable RRSP benefit, if any. Of course the contracts don’t stipulate this outright, but funding limits and structures present non-profits with the hard choice of either accepting such under-resourcing or turning down an opportunity to undertake mission-related work. Long-term funding agreements (often called multi-year agreements) were introduced to our community in 1989. The intent was to offer quality-run organizations an ongoing financial commitment by participating funders. The thought was such agreements would help non-profits be more confident of planning ahead, positively impact stability, and create more of a partnership approach to addressing community problems than can be had from one year, zero-based funding. The intent as well was to provide increases over the life of the multi-year agreement to address incremental costs, like wage increases, and hikes in utilities, rents, and other fundamental expenses. I led the effort at United Way in 1989 to launch the first multi-year agreement with one its member agencies. We were excited about doing so for all the reasons stated above. Today, multi-year funding is the status quo at United Way, the City of Edmonton’s FCSS funding program, and numerous provincial government departments. Unfortunately, in many, if not most cases, multi-year agreements have evolved from their progressive intent to become the means by which funders can freeze funding for a long period of time. The argument is typically that there is no “new money” to increase contracted amounts or grant levels. The funding market is perpetually tight seems to be the status quo rationale for flat funding as well as partial funding. There is little conversation about making different choices. The argument that there is not enough money to adequately finance human services is somewhat suspect, for example, when the funds required to support multi-billion dollar development projects are discovered in government coffers. As well, I’ll bet you lunch that none of the funders that have frozen funding for the past number of years have frozen their own budgets during that time. I understand the rationale. How else might they pay for such increases if not to use tax dollars or donor dollars to fund them? Organizations like mine either have to cut staff and services or undertake fund-raising initiatives to fill in the gap. Of course long-term freezing of grants and contracts offers some assurance of a base of funding over three years, but let’s not overstate that to mean a definitive sense of security is present among recipients. All of the agreements have “out” clauses. Government funders and community funders like the United Way do cover administrative and infrastructure costs, but more often than not, they simply allocate a percentage of overall costs to administration and infrastructure. These decisions are not based on any real analysis or study of such costs; it is frankly an arbitrary number. Many other funders (community and corporate) often stipulate they don’t want any of their monies supporting infrastructure. They just want to fund a program or service and seem to forget that programs require buildings, heat, accounting, and the like to operate. One government representative was honest enough to tell me that “we expect that you will fund raise the shortfall from other sources.” I also heard, “we assume you are already receiving support for the infrastructure and administrative costs we don’t cover.” Unfortunately, there are no funders I am aware of that offer ongoing grants or funding for these purposes. There is no logic in thinking that “some one else will cover fundamental costs,” especially when so many others are voicing that opinion. Let me give you another analogy. A colleague and friend from a utility company once told me that her company wanted ALL of their funding to go to our programs, nothing for lights, mileage, paper, printers, rent, etc. My response was: let’s pretend I get a utility bill and send in a cheque for 85% of the bill with a note indicating that the costs of the company’s accounting, facilities, vehicles, etc. should be paid by someone else, not me. Do you think I would get away with that? This problem is not limited to the human services sector. So, let’s pretend about something else. Let’s say your job is to provide training and learning sessions to your company’s employees every day for the next nine months. To pull this off you will need a host of materials, perhaps the development and publication of a training manual for each employee, access to best practice as well as the occasional outside expert. Now imagine that your employer gives you $100 to buy all of that over the next nine months and says that’s it; there is no more money, so make do. Keep in mind that you will be held accountable for achieving stated outcomes. My guess is you would be outraged and rightly so. Did you know that this is what happens to our public school teachers? In order to teach their students, teachers who are serious about teaching well have little choice but to buy the needed supplies and materials out of their own pockets. The cost can be as much as $3,000 per year. What would your reaction be if your employer just expected you to do that? I find it somewhat ironic that the Minister of Education wants to hunker down and get more focused on holding teachers accountable. He is concerned about bad teachers and their impact on children. I am not against appropriate assessments, but I wonder why the Minister is not hunkering down to ensure our school systems can afford the supplies and materials that are critical to teaching students well. At Bissell Centre we enjoy some great relationships with funders. Some government departments are stellar funders of needed services; others less so. Some funders step up to help out with extra funding when we have an emergency like a fire that destroys one of our buildings. The City of Edmonton just did that. Other funders stepped up last year (the City included) as well when we experienced our first fire. Yet as mentioned earlier, we have funding arrangements where funding has been flat for six years. Six years. I should mention that our individual donors seem to understand that their contributions are needed for all costs associated with delivering Bissell Centre services. We give them a choice of directing their gifts to particular program areas or to “where Bissell Centre needs the money most.” With rare exception, our donors choose the latter. Thankfully. For organizations like us to treat our employees appropriately and to pay increasing utility bills and so forth, we have to, again, find the money somewhere else. No one really knows where that “somewhere else” is, and I imagine if funders knew where that was that is how they would fund their own rising costs. Right? 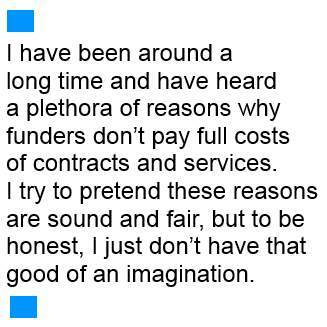 I have been around a long time and have heard a plethora of reasons why funders don’t pay full costs of contracts and services. I try to pretend these reasons are sound and fair, but to be honest, I just don’t have that good of an imagination. Just to round this off with some more facts. At Bissell Centre, we will have to raise $2 million on our own in order to keep many of our programs open. That is because funding is already not enough to cover the full costs of keeping our drop in program open seven days a week, providing more than 140,000 meals per year, providing free child care to low income families who can’t afford it, among other programs. With respect to our free child care program: it’s an accredited early learning centre, replete with professional, qualified staff. We are the only free child care program for low income families in Edmonton. And each year Bissell Centre has to fundraise 40% of its budget because funders choose not to fully fund it. Yes, it is a choice. Funders make choices, just like governments do. For the last three years we have raised enough money and managed our expenses to sustain our services. But I am worried that we will be expected more and more by funders to somehow find the money to adequately support increased infrastructure and operations costs somewhere else while they, for some reason, don’t believe they should have to do the same. Choices are made from a sense of, or a commitment to priorities. It’s facile to suggest that funders and governments are victims of circumstance. Truth is we create our own environment and the current environment seems out of whack to me.